Gareth Negus opens ‘Cult Cinema: An Arrow Video Companion’ and finds a mix of bullseyes and misses. Given half a chance, many film buffs of a certain age will reminisce fondly about the BBC2 film strand Moviedrome, which saw Alex Cox (mostly) introduce a variety of films that all carried the label ‘cult’. The films themselves varied enormously, and while you were almost certain to find some that seemed baffling, pretentious or just dull, the chances were that they were baffling, pretentious or dull in really interesting and unusual ways. We don’t have Moviedrome anymore, and it would be hard to think of a TV channel that would commit to it. But it left its mark on a generation of young and curious viewers, one of whom was Ben Wheatley, now a cult film director in his own right – most recently of High-Rise. 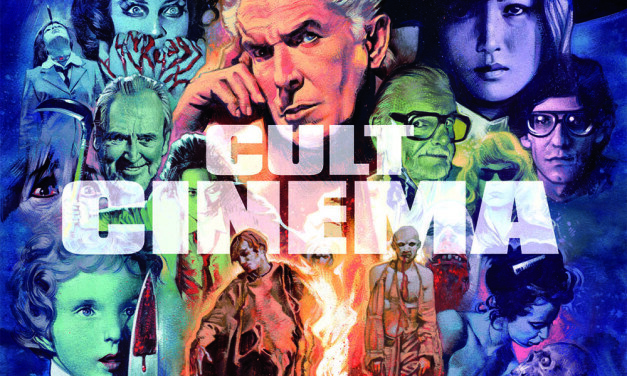 Wheatley provides the introduction to the new book, Cult Cinema: An Arrow Video Companion, in which he credits Moviedrome as playing a part in his own film education. It’s arguable that the Moviedrome mantle has been picked up by Arrow, who since 2009 have been releasing lovingly restored and curated editions of films ranging from cult masterpieces to genre favourites (and the occasional piece of wretched tat that has acquired nostalgia value). And now there’s a limited edition book to go with them. This book is described as “a look at cult cinema through the lens of Arrow Video”, an approach which has its problems. ‘Cult’ films come in a variety of genres and styles, but the book leans towards the horror titles which form the backbone of the Arrow line – Argento, Fulci, Craven, Romero and Corman are all present and correct – to the point where the piece on Withnail and I looks like the odd one out. One thing for the Arrow collector to note is that two thirds of the 30 essays have previously been published in the booklets which accompany the company’s DVD releases – this seems like a high proportion for a book that’s on sale for around £50. The book is divided into sections (Films, Directors, Genres, Actors), which leaves some of the essays looking slightly awkward in their new context. For example, Jasper Sharp’s piece on Seijun Suzuki, one I was looking forward to, being wholly unfamiliar with the director, was written for the Arrow release of Branded to Kill; if Sharp had been asked to write something on the director’s entire career, I suspect he would have approached the task differently. By contrast, Mike Sutton’s newly-written piece on Wes Craven – though covering material likely to be familiar to most potential readers – is an efficient introduction to its subject’s oeuvre, while Caelum Vatnsdal’s piece on David Cronenberg avoids familiarity by focusing on the director’s rarely seen early, short films. Something of a mixed bag, then – some strong pieces, some new discoveries but also some that feel overly familiar (and just enough typos and grammatical errors to set my teeth on edge). Is it worth the money? You will have to judge for yourself how much disposable income you are able to commit to one company, but while I can’t judge it as a physical object (the review copy came as a pdf), I can imagine that it would look lovely on the shelf next to your stack of Arrow DVD and blu-rays, or lying seductively across your coffee table. Given its limited edition status, if you want it, you’ll have to be quick – but bear in mind that you’ll probably be able to sell a copy for a small fortune on ebay in three months’ time. Cult Cinema: An Arrow Video Companion is out now. Gareth Negus owns a grand total of 8 Arrow DVDs. He tweets at @garethnegus.